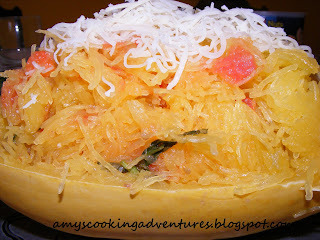 I am not sure about you, but I have been hearing the praises of spaghetti squash for some time now. I hear how it is so versatile and how it is so superly fanstical that you can trick your children into thinking it is noodles and they will eat squash by the bucketful without even realizing it! Him: What the heck is that? Me: You can trick the kids into thinking it’s noodles but really it’s squash, so I’m trying it. Him: (looks at me with an expression that clearly says, “she’s finally lost it—oh my”) Interesting. So I admit, at this point I was a little nervous, but I knew my husband would give me the benefit of the doubt and try it. So, while not successful in tricking my son into eating noodle squash, it was quite enjoyable for the adults in the crowd. I highly recommend making yourself some spaghetti squash, just don’t expect miracles. 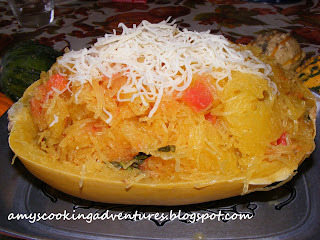 Slice spaghetti squash in half the long way. Scoop out the seeds and strings. Place the halves, cut side down, on a baking dish. Add 1/8 to ¼ inch of water in the bottom of the baking dish. Carefully place in a 350 degree oven for 1 hour or until the skin gives easily under pressure and the inside is tender. Let squash cool for 10-15 minutes or until cool enough to handle. Using a fork, scrape out squash flesh little by little. It will naturally separate into noodle-like strands. Reserve 1 shell for serving. Next, heat olive oil in a skillet. Sauté tomatoes, and garlic for 3-5 minutes. Stir in basil, sauté for 1 additional minute. Remove from heat. Toss tomato mixture with squash strands. Spoon into remaining shell for serving and top with cheese. Serve immediately. Spaghetti squash is delicious! I have a nice one waiting for me to have enough time to fix it up. I think that I'll have to try your seasonings--it looks delicious!